The role of Mormon women has been the subject of a great deal of debate, discussion, and interpretation, both within and without the Church. (Mormon is a nickname sometimes applied to members of The Church of Jesus Christ of Latter-day Saints.) This discussion often leaves out the larger picture and the context. To understand the role of Mormon women today, we have to look at their overall roles in the scriptures, in the modern past, and in today’s church, home, and society. We also have to evaluate what official Mormon teachings look like and how they influence actual behavior. The Mormon view of womanhood has been a traditional one, but it is one that allows for diversity of practice. It outlines the ideal but does not penalize or judge women who are not living in ideal situations. For instance, while teaching that where possible, women have primary responsibility for child care (but are to be assisted by their spouse), the Church also teaches that others must not judge a woman who is employed. The Lord and the leaders of the Church know there are extenuating circumstances that might necessitate mothers working outside the home (and many Mormon moms do). That is between the family and God. Mormons believe that all people were created as spirits by God prior to their birth. As spirits, we had gender, personality, intelligence, and agency. Our spirits resembled our mortal appearance but lacked the substance of a physical body. We lived in this form for a time before we were born into mortality. During the period of pre-mortal life, we began to develop our character. We had many opportunities to learn and to make choices. We were taught the gospel of Jesus Christ, but it was left to us to decide whether or not we wanted to live what was taught. Decisions always have consequences, however, and the decisions we made prior to our birth were no exception. We were taught God’s plan of salvation, which gave us the opportunity to come to earth to gain bodies, families, and experience. We would retain the gender we had in the pre-mortal life, and we were taught the roles we would fill, both as children of God and as people of our gender. We agreed to all of this. Those who rejected Jesus Christ’s voluntary offer to be our Savior were not permitted to come to Earth. All who are here accepted the plan God presented to us. It was not negotiated. God created the terms of the plan, and those who wished to live by the terms were permitted to come to earth. Those who did not followed Satan, who was the leader of the opposition. We had our agency, but only to choose who to worship and follow. The consequences, as is true of all consequences, were not ours to choose. We were not permitted to remember our time in Heaven, although Mormons teach that we can pray to confirm that it occurred. However, the fact that we cannot remember—because doing so would remove the essential need to learn faith—does not excuse us from what we promised. Our promise to honor and respect the assigned roles of each gender is essential to our successful fulfillment of the purposes of mortality. When God created the world, He began with just two people. One was male, and He named him Adam. Then He created Eve, a woman who would serve as Adam’s wife and helpmeet. She would also be the mother of the children they would have together. The word helpmeet is actually meant to be two separate words that were inadvertently translated as one in the King James Bible. The word meet means fitting or proper. The full term, then, means that Eve was chosen, because she was a proper wife for Adam, because she was like Adam in her talents, aptitude and spiritual stature. It is likely that they had corresponding levels of faith and obedience and that both were competent to handle their specific responsibilities. President Spencer W. Kimball said the term man in the creation story refers to the complete man, meaning both the husband and wife, who together make a complete unit. He said that God created the family complete with instructions on how they were to operate: Adam to till the ground (support the family) and Eve to have primary responsibility for the children. Neither role was optional. If Adam did not till, the family would not have food or clothing. If Eve did not care for her children, they would die or fail to be prepared for life. Both roles were equally valuable, because without either one, the world could not progress. By assigning each a role, it reduced arguments and discontent. Those who trusted God would find joy in filling the role He chose for them and both parts of the family’s needs would be met . The message of the creation, in the study of gender, is that God does indeed approve of dividing the work of the world by gender. He chose that children would be born only to women, and He assigned their care to women. God is not sexist, and so we can understand that it is merely one way to divide the work, not a statement on worth. In fact, God has made it clear throughout the scriptures that children are important, and their proper care is a sacred duty. This helps us to see that parenting is not a demeaning role. It is the sacred gift of being permitted to help raise God’s beloved children. Jesus Christ was absolutely fearless in His ministry. He never worried about what would be popular or politically correct. He did only what His Father in Heaven taught Him to do. Therefore, it is valuable to look at how He organized His Church in order to see how He wants the Church organized today. Jesus had many women in His life, all of whom He treated with great respect. He did not see them as “merely” homemakers, but considered them intelligent. He expected them to study, to learn, and to be disciples of Christ. The story of Mary and Martha illustrates the dual nature of womanhood expected by God. When the Savior came to their home, both women sat at Jesus’ feet to learn from Him. However, mealtime approached, and Martha went to prepare the meal. It appears that rather than quickly preparing something they could eat without taking too much time away from the opportunity to learn, she set out to create an elaborate meal. Martha is, of course, like most women. When we have honored guests, we want to give them our best. Her best required a great deal of effort, though, particularly in this time before modern conveniences, and she became tired and frustrated, because she was trying to prepare this meal alone, when she really wanted to be in the other room learning from the Savior. She asked Jesus to make her sister help her. To her surprise, He did not do so. He praised Martha for her concern for domestic things, but suggested that at this particular moment, the focus should be on the spiritual. There is a time when domestic concerns should take priority, and a time when the spiritual comes first. He taught Martha that He honored both the domestic roles of women and the intellectual and spiritual roles. He expected them to learn the gospel, even while fulfilling their roles as homemakers. Simon, who is called Peter, and Andrew his brother; James the son of Zebedee, and John his brother; Philip, and Bartholomew; Thomas, and Matthew the publican; James the son of Alphæus, and Lebbæus, whose surname was Thaddæus; Simon the Canaanite, and Judas Iscariot, who also betrayed him (Matthew 10:2-5). All of those called to be apostles were men. When new apostles were required, they were also men. It is important to note that apostles and disciples are not the same. The Bible Dictionary for The Church of Jesus Christ of Latter-day Saints defines a disciple as, “A pupil or learner; a name used to denote (1) the Twelve, also called Apostles, (2) all followers of Jesus Christ. We also read of disciples of John the Baptist and of the Pharisees (Mark 2:18).” While the apostles were all disciples, the disciples were not all apostles. We can presume, given the number of amazing women in Jesus’ life and world, that had it been desirable to select female apostles, He would have done so. He is not sexist, any more than His Father in Heaven is, and He certainly had wonderful women to choose from, including Mary and Martha, who were discussed above. The fact that He did not, and that He came to set the example and pattern, tells us that apostleship and priesthood were simply not the assignments God chose for women. Mormons teach that women have long been organized, so we can presume there were women’s organizations like the modern Mormon Relief Society in place and that these women served in those capacities. Their work in the ministry was vital to its success. They provided the Savior with housing and food as needed, but they also listened and learned as He taught. They took the message to their own children and prepared them to face the intense persecutions that would face the early Christians after the Crucifixion. Their parenting helped to ensure the Church would continue when Christ was gone. We can guess that they served in other ways, even when they are not specifically mentioned. Paul noted that older women were to teach younger women how to serve in the Church. They played an important role as disciples in the Church, and ordination was not required in order to make an eternal difference, because ordination didn’t happen to be their specific responsibility. From the beginning, Mormon women played unusually powerful roles in their Church, roles frequently denied women in other religions. The structure of the Church and the early challenges created strong, opinionated, and faithful women. Those who were not strong often did not survive the many challenges of early Mormonism, and so those who remained faithful were a powerful force. Although today’s missionaries are unmarried or serve as couples, in the early church, married men served missions. They were away for many months and sometimes for years, often coming home for a short time before leaving again. This meant the women were left to support the family, since missionaries were unpaid, to run the home, and to raise the children. They became very skilled at labors traditionally handled by men. They knew how to manage money and to make decisions. It is no surprise, then, that they had far more rights than the women living traditional roles outside the Mormon communities. When their husbands were home, they honored his role as the leader of the home, but they did not stop being competent and independent. Jane Manning, an African-American convert to The Church of Jesus Christ, represents the independence and competence of Mormon women. A year after her baptism, she and eight members of her family decided to move to Nauvoo, Illinois, where the Mormons were then gathered. They were not slaves, but Jane had been employed since early childhood and was very mature. Jane, still a teenager, took on the role of leader for this group of travelers. Although they began their journey with a racially integrated group, they were separated when a boat captain refused to allow the African American passengers to board. The reason for this is not clear—Jane’s dictated autobiography says the money was requested too soon—but Jane and her family were forced to continue on by foot, knowing the journey would be simpler with a smaller group. The journey was long and dangerous, particularly when they were mistaken for runaway slaves. Since they had never been slaves, they had no freedom papers to prove they were free. Jane’s group traveled 800 miles by foot, often with their bleeding feet leaving a trail of blood in the snow. They had little food, and their shoes did not last the trip. Eventually, however, they came to Nauvoo and were directed to Joseph Smith’s home. Joseph Smith was the first Mormon prophet. His wife Emma saw them approaching and called them to her. Joseph brought them to the table and invited them to join the family for their meal. He asked Jane for a report of their journey. Then he invited them to remain in his home until they found employment and houses. When all but Jane had been placed, Joseph and Emma hired Jane themselves. Eliza R. Snow was an outspoken Mormon leader. She exemplified the strong, outspoken nature of Mormon women in pioneer Utah. Governor Boggs of Missouri, who issued the infamous extermination order on Mormons, was startled to discover that Eliza R. Snow was not afraid of him. He said he was going to “cure” her of her Mormonism after she confronted him concerning the order. She told him it would take a great deal more than he could do to carry out that threat, and he backed down, admitting that she was a better soldier than he was. She said later she didn’t consider that much of a compliment. Eliza was the sister of future Mormon prophet Lorenzo Snow, and it was she who converted him. She taught school in response to Joseph Smith’s determination to see to it that Mormon girls were well-educated. She refused a number of marriage proposals, but agreed to be married to Joseph Smith as a plural wife two years before his death. After his death, she was married to Brigham Young, the second Mormon prophet, but this appears to have been a courtesy on his part, and the two were simply very good friends. However, he valued her intelligence and competence and would use her in increasingly important roles in the Church. She was an author and poet, but her most valuable contribution might have been her fierce defense of Mormon women. When the women wanted to re-establish the Relief Society, the women’s auxiliary, in Utah, Brigham Young asked Eliza to help each congregation set up an organization. She was called to preside over all the branches in 1880, but served unofficially in that role long before, helping to organize 300 branches of the program. She worked to fulfill Brigham Young’s request that women become more self-sufficient. To this end, she taught them to store wheat for emergencies, to raise silk as a way of providing income, and to receive medical training. Many Mormon women went to medical school to become doctors or nurses long before it was considered acceptable for women to do so. She directed women’s suffrage activities through the Relief Society. Mormon women had been permitted to vote before Utah became a state. When they achieved statehood, the federal government removed that privilege. Naturally, the women were furious. With the full support of Brigham Young and other men in the Church, Mormon women fought hard to regain their rights. I will now ask of this assemblage of intelligent ladies, Do you know of any place on the face of the earth, where woman has more liberty and where she enjoys such high and glorious privileges as she does here as a Latter-day Saint? No! the very idea of a woman here in a state of slavery is a burlesque on good common sense … as women of God, filling high and responsible positions, performing sacred duties—women who stand not as dictators, but as counselors to their husbands, and who, in the purest, noblest sense of refined womanhood, are truly their helpmates—we not only speak because we have the right, but justice and humanity demands we should! (quoted in Jaynann Morgan Payne, “Eliza R. Snow: First Lady of the Pioneers,” Ensign, Sep 1973, 62). Emmaline B. Wells was a leader in the Women’s Suffrage Organization in Utah. Abandoned by her first husband and widowed by her second, she then married polygamist Daniel Wells. She was a school teacher and then a writer. After her marriage to Wells, she eventually became editor of the second women’s magazine, the Women’s Exponent. The magazine’s goal was to encourage women to be knowledgeable concerning politics and world events. Through her work with this publication, she met many of the leaders of the women’s movement and developed a friendship with Susan B. Anthony. Emmaline B. Wells was vice-president of the Women’s Suffrage Association and was serving in that position when Utah women successfully won back the right to vote. While many argued that polygamy was a violation of the aims of the women’s movement, she said she had more freedom to do whatever she wanted than did women in non-polygamist marriages. Her husband divided his time between his wives, and this allowed her the freedom, time, and money to have her own life and career. When she died, Utah flags were flown at half-mast, the first time this had been done for a woman, and the president of the Church spoke at her funeral. Mormon history is filled with women such as these, but today’s Mormonism also has strong and capable women. The structure of the modern church gives women opportunities to learn leadership and life skills that are unique among most churches. Continuing the calls by Jesus, Joseph Smith, and Brigham Young for women to be well-educated, the Mormons encourage literacy and education among its members. The Relief Society operates a literacy program that helps people learn to read in just a year and a half. While men may take the classes and teach them, the literacy leader must be female—not because men couldn’t lead it but because it is not their responsibility. It is a Relief Society program and the responsibility of the women. The program encourages those who complete the literacy program to then become teachers in it, helping them to go from illiterate to teacher in just a few years. Many congregations also offer classes to help people learn the native language. These skills allow women to better support their families or to train their children. Employment specialists help them find better jobs. In most religions, restricting the priesthood to men means that women have few opportunities to participate in the ministry. This also holds true for men who do not enter the ministry. This situation is not valid in Mormonism. Mormons operate a lay church, and because they have extensive staffing needs, nearly everyone has a volunteer church job, referred to as a “calling.” In addition, the bishop—a lay pastor—does not give the weekly sermon or say the prayers during services. Each member of the congregation has an opportunity to do this. Sermons, called talks, are given by two to three people each week. Teenagers twelve and older speak for five minutes and adults for ten to twenty minutes, depending on whether or not there are youth speakers. The opening and closing prayers for worship services are also given by congregational members. While most churches allow one or two people to preach or pray, Mormons give this opportunity to every teen and adult, male and female. They were doing so long before most churches accepted women into the ministry. Of these, approximately 4 million are women who belong to what we call the Relief Society of the Church. I think it is the oldest women’s organization in the world and perhaps the largest. It has its own officers and board, and these officers also sit on other boards and committees of the Church. People wonder what we do for our women. I will tell you what we do. 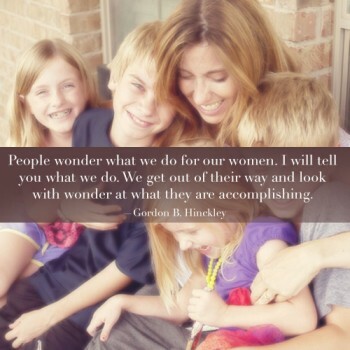 We get out of their way and look with wonder at what they are accomplishing. The Relief Society’s programs are of as much value as any program in the Church. Only women can lead and serve in it, except in the literacy program, where, as mentioned, men can serve but not lead. They have a three-woman presidency at the congregational level and at the stake level. A stake is similar to a Catholic diocese, and comprises a number of congregations in a geographical area. In addition, a group of three women lead at the international level, and this gives them authority over more women than any CEO in the world. This same pattern is followed by the Young Women program for teenage girls, and the Primary program for children, both of which are led only by women. However, in the Primary program, men may serve as teachers and Cub Scout leaders, but may not serve in the presidency of the organization. All men serve under female leaders. The Relief Society oversees the majority of humanitarian work in a congregation, which is naturally an essential part of any religious organization. The Relief Society president works with the bishop to provide for families with temporary food insecurity or other temporal needs. She sees to it that each woman has visiting teachers—two women who visit, establish a true friendship, and meet or report any special needs the woman might have. This program has received awards from organizations for senior citizens because it helps to provide companionship and protection for elderly women who live alone. The program also offers both temporal and spiritual education. In the past, the Relief Society operated medical schools, hospitals, and social service agencies. Today, the organization runs programs on a more local level to meet the unique needs of a world-wide church. They offer classes and clubs in any field of interest to the women in a congregation—genealogy, home repair, languages, and literature, for instance, each congregation chooses its own, generally from suggestions made by members of the congregation. “There’s a distinction between the authority of the priesthood and the power of the priesthood. And I think sometimes people don’t understand that. It can be — the authority can be conferred upon a man, but the power can only be exercised in purity,” Elaine S. Dalton said. Sister Burton added that men receive its power in the same way women do. She noted that the priesthood isn’t men. They can only use it to bless others. They cannot use it to bless themselves. If a man needs a priesthood ordinance performed for him, he too must seek out one or two priesthood holders to do so. He cannot give himself a blessing, baptize himself, or carry out any of the other ordinances at which the priesthood officiates. Priesthood is a method of serving God, and through it, the bearers can serve others. The Church provides a multitude of ways for every person, even young children, to serve God, and no specific assignment is more important than any other. What matters is that the work of the kingdom be done—not who does it. Every member’s contribution is counted as equally valid and valuable before God. With the work of Relief Society sisters, we help build up the kingdom and strengthen the homes of Zion. No other organization in the Church can do the service Relief Society does. (Silvia H. Allred, Previous First Counselor in the Relief Society General Presidency,“Every Woman Needs Relief Society,” General Conference of The Church of Jesus Christ of Latter-day Saints, October 2009). This whole section on pre-mortal life is too wordy, awkwardly so. Awkward sentence suddenly in the plural. Rewrite.